Upload small or large data sets from spreadsheets or CSV files. 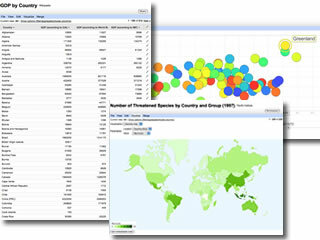 Visualize your data on maps, timelines and charts. Pick who can access your data; hide parts of your data if needed. Merge data from multiple tables. Discuss your data with others. Track changes and discussions. Upload data tables from speadsheets or csv files. During our labs release, we can support up to 100MB per table, and up to 250MB per user. You can export your data as csv too. See the data on a map or as a chart immediately. Columns with locations are interpreted automatically, and you can adjust them directly on a map if necessary. Use filter and aggregate tools for more selective visualizations. Invite collaborators to view, contribute columns or edit. Just enter the email addresses of the people with whom you want to share a table and send them an invitation. Merge your data with other data tables. When another table has information about the same entities, merge the tables together to see all information in one place. When any data table is updated, the merged table will show the latest value too. Discuss data rows, columns or cells. Multiple people can view and comment on the data. Discussions display people’s commments and any changes to the data over time. Define a subset table to share. Choose only the columns you want to share with others. Save as a linked table with its own share permissions that will always show your current data values. During data import, you can specify attribution for the data. The attribution will appear even when your data is merged into other tables. Embed your visualization in other web properties. Now that you’ve got that nice map or chart of your data, you can embed it in a web page or blog post. It will always display the latest data values for your table and allow you to communicate your story more easily. via Google Fusion Tables (Beta).